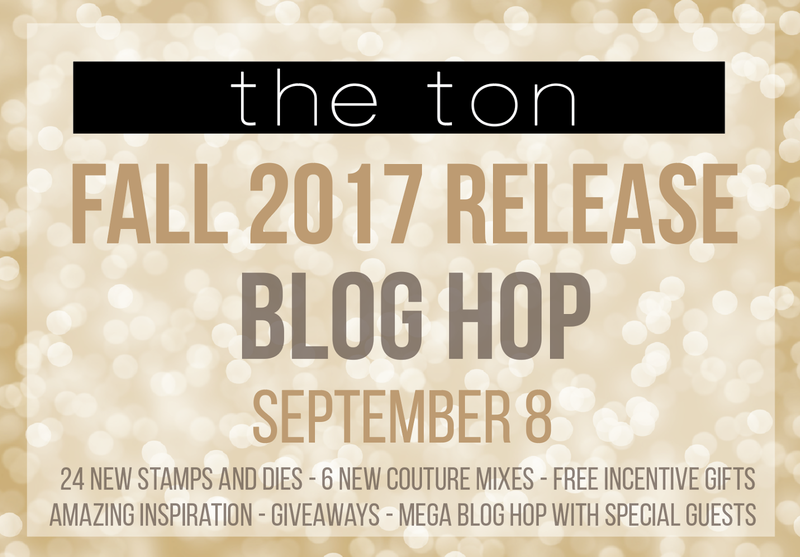 Hello and Welcome to the Fall Release for The Ton Stamps! I'm so honored to be included in the hop today! 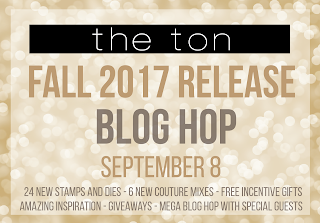 I adore The Ton's floral stamps and their fall/holiday collection is no different! I started out with the gorgeous Holiday Love Poinsettia. Wow is all I can say! The image in this set is such a perfect size for the focal point of a card. I've white heat embossed the image onto Bristol Smooth watercolor paper. I had fun watercoloring using my Zig Clean Color Real Brush markers for this deep poinsettia color. I used Deep Red, Wine Red, and Carmine Red. For the leaves I used Mid Green and Olive Green. To highlight my image, I watercolored around the perimeter of the poinsettia with watered down Distress Oxide ink in Broken China. It gives the most perfect shade of blue! (the photo makes it lighter than in real life) I stamped my greeting in Versafine Onyx Black ink and did some gold flicks of Heidi Swapp Color Shine. My panel was trimmed, layered onto a pink panel, and a strip of black/white pattern paper adhered down the left side. This card is essentially one layer and will be perfect for mailing this holiday season! Next, I am changing gears a bit and am using the Magnificent Magnolias stamp set. I've stamped the largest magnolia image onto Bristol Smooth watercolor paper both in the left lower and upper right corner with Versafine Onyx Black ink. I've used this ink because it is very good with watercolor! Using watered down Distress Oxide inks in Worn Lipstick and Peeled Paint, I loosely colored in the images, letting the panel dry completely in between layers. This is key in achieving this look. After letting my panel dry, I splattered some black ink over my colored images. My sentiment was white heat embossed onto a thin strip of black cardstock and trimmed at an angle. My sentiment was adhered with foam adhesive over a strip of silver glitter cardstock and a few sparkling clear confetti were adhered. Love how you've used the stamps from the new release. 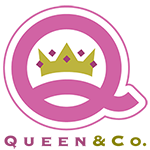 Very pretty design, gorgeous projects! Gorgeous cards. I love the classy yet elegant look of the first one. Another fabulous release by The Ton. The magnificent magnolias are out of this world! So pretty, your choice of colours works amazingly! Great cards! I love the stamps from this release. Your cards show them off beautifully. Thanks for sharing your pretty card. Such pretty cards! I couldn't wait to shop this morning!! Lovely water colouring on that first card. that stripe really adds to the card. 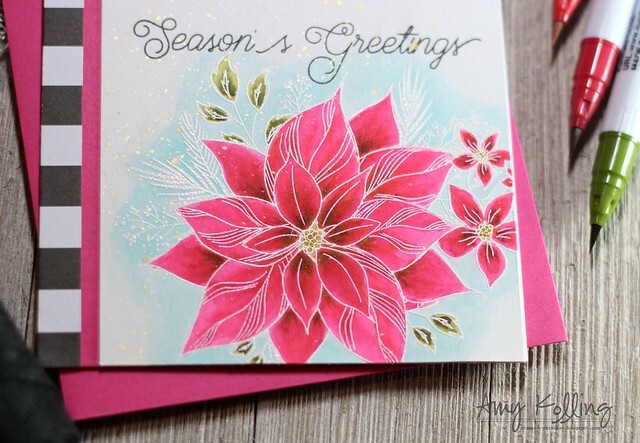 WOW Amy, both cards are fabulous but the poinsettia has my heart! Just gorgeous! I love your poinsettias!!! They make beautiful cards. Thanks for sharing your talent. These are so pretty. Your water coloring is wonderful. Wow!! Such lovely cards!! I love the Magnolia card. Beautiful coloring. My favorite is your poinsetia card. So so pretty. I love your poinsettia card. The soft blue hue behind the poinsettia is a wonderful touch. Love your beautiful cards. Fantastic coloring. Pretty, pretty cards. Love the pinks and reddish colors. Beautiful cards, I love the poinsettia. Your cards are beautiful. I love the poinsettia and the way you colored it. I love this release! So beautiful. Your colouring is stunning! Thank you for sharing your creativity. Beautiful cards, so elegant and delicate. WOW - WONDERFUL cards Amy! Your magnolias are a DELICATE DELIGHT and your poinsettias, well they're ABSOLUTELY GORGEOUS! Wow, very beautiful cards. Love both of them. Both cards are gorgeous but I do love the poinsettia card, the muted blue background is gorgeous! Great coloring on the flowers. Two great cards. I love the shading of the poinsettia card. Really lovely! Thanks. Amy, both of your cards are so pretty! 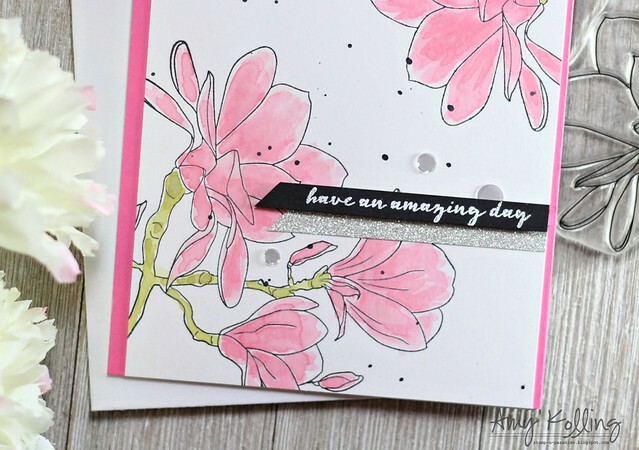 Love how your magnolia card finished up. The Ton has presented us with a great release! Beautiful cards. The coloring is just amazing. My goodness, girl you knocked it outta the park with your Brilliant cards!!! I love each one of them. Thank you for the inspiration! 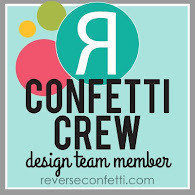 Love these gorgeous designs Amy!! Amazingly colored! Thanks for the inspiration ! Have a wonderful day! Such lovely colors and cards!! Both of your cards are beautiful, Amy! I especially love how you colored the poinsettias with your Real Brush Real Color markers. I have a set and need to learn how to use them better. I doubt my cards will ever look like yours, but I'd still like to try! Gorgeous poinsettias and magnolias! Beautiful cards! Amazing cards! Love the poinsettias. Beautiful cards!!! Thanks for the inspiration. Great cards and lovely color choices. Thanks for sharing! Beautiful florals and I love how you colored/watercolored them, especially the poinsettias! 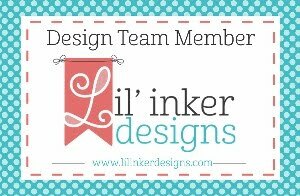 Catherine Pooler Designs / CAS(E) this Sketch!